(Nanowerk News) A significant breakthrough in laser technology has been reported by the U.S. Department of Energy (DOE)'s Lawrence Berkeley National Laboratory (Berkeley Lab) and the University of California (UC) Berkeley. Scientists led by Xiang Zhang, a physicist with joint appointments at Berkeley Lab and UC Berkeley, have developed a unique microring laser cavity that can produce single-mode lasing even from a conventional multi-mode laser cavity. This ability to provide single-mode lasing on demand holds ramifications for a wide range of applications including optical metrology and interferometry, optical data storage, high-resolution spectroscopy and optical communications. "Losses are typically undesirable in optics but, by deliberately exploiting the interplay between optical loss and gain based on the concept of parity-time symmetry, we have designed a microring laser cavity that exhibits intrinsic single-mode lasing regardless of the gain spectral bandwidth," says Zhang, who directs Berkeley Lab's Materials Sciences Division and is UC Berkeley's Ernest S. Kuh Endowed Chair Professor. "This approach also provides an experimental platform to study parity-time symmetry and phase transition phenomena that originated from quantum field theory yet have been inaccessible so far in experiments. It can fundamentally broaden optical science at both semi-classical and quantum levels"
Zhang, who also directs the National Science Foundation's Nano-scale Science and Engineering Center, and is a member of the Kavli Energy NanoSciences Institute at Berkeley, is the corresponding author of a paper in Science that describes this work ("Single-mode laser by parity-time symmetry breaking"). A laser cavity or resonator is the mirrored component of a laser in which light reflected multiple times yields a standing wave at certain resonance frequencies called modes. Laser cavities typically support multiple modes because their dimensions are much larger than optical wavelengths. Competition between modes limits the optical gain in amplitude and results in random fluctuations and instabilities in the emitted laser beams. "For many applications, single-mode lasing is desirable for its stable operation, better beam quality, and easier manipulation," Zhang says. "Light emission from a single-mode laser is monochromatic with low phase and intensity noises, but creating sufficiently modulated optical gain and loss to obtain single-mode lasing has been a challenge." While mode manipulation and selection strategies have been developed to achieve single-mode lasing, each of these strategies has only been applicable to specific configurations. The microring laser cavity developed by Zhang's group is the first successful concept for a general design. The key to their success is using the concept of the breaking of parity-time (PT) symmetry. The law of parity-time symmetry dictates that the properties of a system, like a beam of light, remain the same even if the system's spatial configuration is reversed, like a mirror image, or the direction of time runs backward. Zhang and his group discovered a phenomenon called "thresholdless parity-time symmetry breaking" that provides them with unprecedented control over the resonant modes of their microring laser cavity, a critical requirement for emission control in laser physics and applications. "Thresholdless PT symmetry breaking means that our light beam undergoes symmetry breaking once the gain/loss contrast is introduced no matter how large this contrast is," says Liang Feng, lead author of the Science paper, a recent posdoc in Zhang's group and now an assistant professor with the University at Buffalo. "In other words, the threshold for PT symmetry breaking is zero gain/loss contrast." Zhang, Feng and the other members of the team were able to exploit the phenomenon of thresholdless PT symmetry breaking through the fabrication of a unique microring laser cavity. This cavity consists of bilayered structures of chromium/germanium arranged periodically in the azimuthal direction on top of a microring resonator made from an indium-gallium-arsenide-phosphide compound on a substrate of indium phosphide. The diameter of the microring is 9 micrometers. 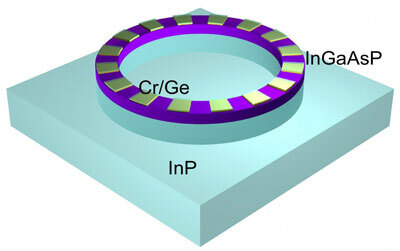 "The introduced rotational symmetry in our microring resonator is continuous, mimicking an infinite system," says Feng. "The counterintuitive discovery we made is that PT symmetry does not hold even at an infinitesimal gain/loss modulation when a system is rotationally symmetric. This was not observed in previous one-dimensional PT modulation systems because those finite systems did not support any continuous symmetry operations." Using the continuous rotational symmetry of their microring laser cavity to facilitate thresholdless PT symmetry breaking, Zhang, Feng and their collaborators are able to delicately manipulate optical gain and loss in such a manner as to ultimately yield single-mode lasing. "PT symmetry breaking means an optical mode can be gain-dominant for lasing, whereas PT symmetry means all the modes remain passive," says Zi-Jing Wong, co-lead author and a graduate student in Zhang's group. "With our microring laser cavity, we facilitate a desired mode in PT symmetry breaking, while keeping all other modes PT symmetric. Although PT symmetry breaking by itself cannot guarantee single-mode lasing, when acting together with PT symmetry for all other modes, it facilitates single-mode lasing." In their Science paper, the researchers suggest that single-mode lasing through PT-symmetry breaking could pave the way to next generation optoelectronic devices for communications and computing as it enables the independent manipulation of multiple laser beams without the "crosstalk" problems that plague today's systems. Their microring laser cavity concept might also be used to engineer optical modes in a typical multi-mode laser cavity to create a desired lasing mode and emission pattern. "Our microring laser cavities could also replace the large laser boxes that are routinely used in labs and industry today," Feng says. "Moreover, the demonstrated single-mode operation regardless of gain spectral bandwidth may create a laser chip carrying trillions of informational signals at different frequencies. This would make it possible to shrink a huge datacenter onto a tiny photonic chip."